If you are familiar with names like Adobe, Alias, Apple, Avid, Discreet, Eyeon, Media100, Newtek, Pinnacle, Sony, Quantel you will be surprised to find out that there is an open source, video editing and post-production software that is freely available and that just awaits you to be downloaded, installed and put to good use. Called Jahshaka, this grassroots real-time video production powerhouse integrates multiple fully featured modules including a frame-by-frame paint over video facility, a production titling component, full video and audio editing, animation, and a special effects lab. With this technology you don't need to spend hundreds or thousands of dollars to produce video that is as good as its editor. No need to buy a set of brand name applications that can do the same while emptying your wallet. Jahshaka is capable of playing all major media formats from Flash and .avi to Quicktime, Windows Media and Real. It plays uncompressed video sequences and makes it possible to view and even edit video in any format or resolution. Jahshaka leverages the power of OpenGL and OpenML to provide a unique video production suite that can run on Windows, Mac OSX, Linux, Irix and (soon) on Solaris. 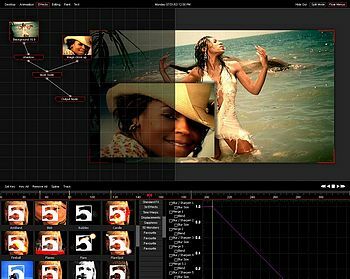 The goal of the Jahshaka project is to produce an industrial strength editing, effects, and compositing system that works on uncompressed video and audio, at any resolution, in any existing colorspace. If you are a professional video editor you can download Jahshaka right now and see whether this is vaporware or whether you would actualy advise small and independent video makers to adopt this tool in place of its much more expensive predecessors. I would actually be interested myself in hearing your opinion on this and to share back with Jahshaka what you think may be the major areas of improvement that the product development team has to work on. Here is my edited summary list of Jahshaka version 3 planned features, many of which have already made their debut inside the existing public version (1.9x). The desktop is the main module, it unites all the modules and features together. On the desktop you can load, save, import, export grab video or view still and clips that have been loaded into the system. The desktop also has an integrated player which can scrub files on disk or load clips into RAM for realtime playback of uncompressed footage. The animation module is a true 3D compositing and effects system. With support for realtime playback (on supported OpenGL hardware). Fully keyframeable animation and keyable objects. Resolution independent image support allows the loading of any image into the 3D world. The editing module is a timeline based, multi-layer editing environment. With support for realtime video and effect playback (on supported OpenML hardware) the editing module will support mixing clips of different resolutions, formats and colorspaces. Also integrated unlimited audio, video and overlay layers. The effects module is a true image processing environment, expandable by plugins based on the OpenApi to create anything from blurs, glows, optical effects, lens effects and edge filters to whatever your creative abilites can think of. The Library module allows you to organize all your media. Full local and peer-to-peer networking will allow you to share files and projects with users next to you, next door or around the world. 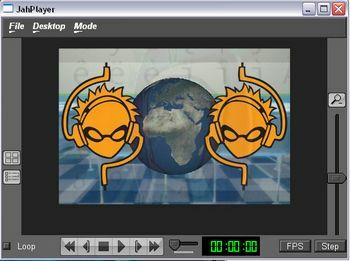 The JahPlayer is the final complement to a production suite that also envisages production of individual free tools for video editing, photo editing, music editing and more. While there is still a lot of work to do before the present JahPlayer release can become a real competitor to Windows Media Player, Quicktime or Real, the team at Jahshaka does have the first player to sport a built-in 3D engine! The JahPlayer is also the only one to support a video out channel as well as being the first out supporting full playback of HD/PAL/NTSC formats. The JahPlayer can play back uncompressed video sequences and integrates display of standard SMPTE timecode. Interestingly enough, since last September (04) the development team at Jahshaka has also been working on a Jahplayer that would work on Nokia mobile phones. Here is a sneak preview at the JahPlayer running on a Nokia Ngage and here is the link to its direct download. Jahshaka is licensed to the public under the GNU GPL agreement. Seriously John G.? Because one link doesn't work you conclude that an entire application has been scrapped? You have earned an F for effort. It's too bad there's not some thing available that could facilitate searches. A search powerplant maybe....or no..search motor? Hmm...engine? yeah! "Search Engine" sounds better..too bad that doesn't exist and you couldn't just type in a word....like, say "Jahshaka" and find alternate links where you could download it. Man, when stuff like that exists some day, the future is gonna be AWESOME. Jahshaka is not dead. It is still alive and it downloads fine on my desktop. Not really sure what the point of keeping this page alive is. The software has long since gone the way of the dinosaurs. It doesn't exist. When you click the link you get diverted to cinefx.org where you find that the editing software has been renamed to "Cinefx", except when you download it it won't even load (on Mac OSX). Obviously this project is dead, dead dead. Which is a shame because a viable open-source alternative to $1,000+ programs like After Effects could only be a good thing. This just isn't. To those who read this comment, keep GooglingBinging cause this isn't the solution. All this hooplah for a dead link - must have been LOTS of bugs (did'nt that guy below - who sounded like he knew what he was talking about - say he "wouldn't even consider it "alpha" software? - OUCH!). Ow I see it's pretty easy to google a working link, sorry :) Still it may be nice to fix the ones in the text :) Good luck with the project! Does this program have any particle effects in it like explosions? I've been looking for several free tools to kick-start an independent feature. While there are some great opensource software available for 2d/3d graphics (Gimp, Blender etc), the only thing lacking was an appropriate editing and effects software-package. This looks like its going to be it. I'll definately try it out. i have also mentioned it on my blog..
thanks you for this nice app. I'm happy that Jahshaka is open source that's the good part. This is in regard to not looking at any documentation at all of course. Guess I'll have to look for Jahshaka docs in the meantime. I really can't say for sure. certainly this has not been as stable and easy as Premiere or Final Cut, but it is also software that is completely free. So, I think tat if you enjoy open-source software and the ideas behind it, you may want to give it a good try. If you are instead in for a rock solid software to do video post-production, then give Jashaka a bit more time to smooth out some of its rough edges.